Chances are that when you think of February, Valentine’s Day is the first thing that comes to mind. 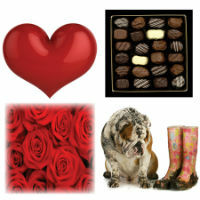 It’s a nice image: hearts, flowers, chocolates, and romantic dinners. It wasn’t always that way. The Old English term for February was Solmonath – or “mud month!” The folks at Hallmark are eternally grateful that this particular moniker didn’t catch on. For a lot of homeowners, dealing with mud is a much bigger problem than picking out flowers or chocolates. And mud isn’t something that’s restricted to one day in February. It’s something many of us face throughout the year. Of course that’s why some brilliant person came up with the concept of the mudroom – to keep mud (and other dirt) out of the home. But your mudroom doesn’t have to be dirty and dingy. Installing larger windows can really brighten it up and make it a more inviting entrance into your home. And it’s a logical place to add increased storage in what could be considered “wasted” space. 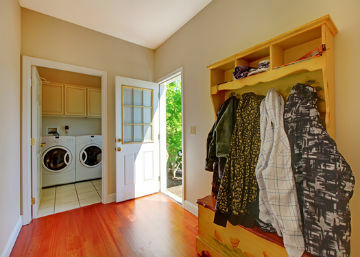 It’s also a great place to put your washer and dryer so that you don’t have to haul laundry down to the basement and back up again. And if you’re a dog owner, you might even want to install a sink for washing the dog (which you can also use for other clean-up projects as well). Maybe the Old English were onto something after all. February may not be “mud month” where you live, but it’s a good time to think about adding a mudroom—or remodeling the one you have to get more out of it.